What is the PHaMs Service? 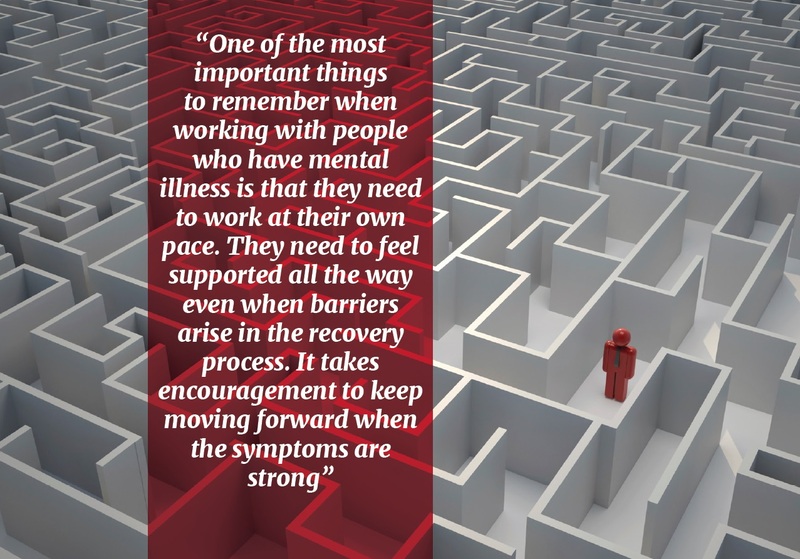 The Personal Helpers and Mentors (PHaMs) service aims to provide increased opportunities for recovery for people whose lives are severely affected by mental illness. It takes a strengths-based, recovery approach to assist people aged 16 years and over to manage their daily activities and to live independently in the community. PHaMs workers provide practical assistance to people with severe mental illness to help them achieve their personal goals, develop better relationships with family and friends and manage their everyday tasks. One-to-one and ongoing support ensures the individual needs can be addressed including accessing services and participating economically and socially in the community thus increasing their opportunities for recovery. PHaMs is a federally funded service with a range of service providers operating in different locations or delivering specialised services. Search for details on the programme at www.dss.gov.au. Ed* is a 29 year old male diagnosed with mental illness. When Catholic Care’s PHaMs Case Manager first met with Ed he was highly anxious, unable to articulate what his goals were and would often say that he did not have any goals. On subsequent appointments and with a lot of gentle probing and trying to understand Ed’s barriers and challenges, it was becoming apparent that Ed in fact had goals but he was unable to articulate them and was scared of failing. In Ed’s own words ‘people have tried to help me before, just like you are doing now, but I always failed’. When Ed started see us the sessions would normally last for 10-15 minutes, ending in Ed walking out of the room, followed by weeks and sometimes months of no contact. Ed would not answer the phone or call for an appointment. Ed over time became more comfortable in sessions, sessions were becoming longer each time and more frequent. At this stage Ed is meeting with his client manager fortnightly. He appears to be comfortably conversing and bringing up topics of interest and asking questions about certain life issues. Ed also started expressing and working on his goals – he enrolled in a TAFE course, attended regularly and recently finalised a course (despite his fear of failure and social anxiety). Ed is now planning to enrol in another course and is expressing his desire to engage in employment. It is very rewarding observing Ed’s journey over time – from someone who could barely sit in a session for 10 minutes to someone who now shows motivation, has a sense of direction and is actively pursuing his goals, which are at the moment finalising courses and seeking employment in order to build on his skills base and confidence. Joan* never thought she would end up homeless and desperately holding on to her sanity when she married her former husband. They had met as volunteers. He was nice and they started to build a relationship from their common interests. It was only after they were married that Joan saw the darker side to his personality. “He would become violent when he was drunk. Some people are fine when they drink, but he became vicious and acted out physically,” Joan explains. After one particularly brutal incident, Joan ended up at the Prince of Wales hospital where she also had a severe mental breakdown. She was moved to the Kiloh Centre where she stayed for the next five weeks. Sadly, Joan’s story is not an uncommon one. According to the ABS, about one in three Australian women experience physical violence during their lifetime, nearly one in five women experience some form of sexual violence and nearly one in five experience violence by a current or previous partner. While one in three victims of domestic violence are men, women are still more likely to experience an act of physical or sexual violence at the hands of a current or former partner. The most common types of injuries are bruises and swelling, cuts, scratches and burns. However, a few also suffer broken bones or noses, sustain head or brain injuries and internal injuries. Almost a third of those who sustain injuries are injured badly enough to require medical attention and one in three women felt their life was in danger in the most recent incident. The health consequences of domestic violence often continue long after the bruises and broken bones have healed. Women who experienced violence report a higher level of severity and multiple mental disorders, increased rates of physical disorders, general disability and impaired quality of life. There were also higher rates of past suicide attempts. Joan had hit rock bottom when she was referred to Anglicare. Anglicare soon arranged a place to stay and began to help Joan slowly rebuild her life. They arranged counselling, regular psychiatrist visits, and got Joan involved in their Personal Helpers and Mentors program (PHaMs). For Joan, the people she has met through the program and the support she has received has given her hope that her situation will eventually improve. This case study has been submitted by Agnes Wilson from Anglicare.